We took a day off to celebrate our ninth anniversary. We had fun all in all but the part I remember most was when we enjoyed a quiet breakfast together at one of our favourite cafes. The food and coffee was great, but that wasn’t it either. When I drill it down, it was the moments we spent listening intently to each other share our different perspectives and ideas on the struggles that we’ve had managing one of our kids who has been showing anxiety and manifesting difficult behaviour. Our hearts have been burdened and we’ve had to rely on God and each other for strength. Seated on a comfy red cushion seat, side by side, I shared my thoughts and observations with him, and he listened quietly and was not in a rush to speak. Too often, as Stephen Covey put it, we listen to respond, instead of to understand. The reason why we do this habitually is because we seek first to be understood, rather than to understand others. But when we do so, the other person inevitably feels second-rate, judged, or simply not heard. He gave me a gift that morning – the gift of empathic listening. I didn’t realise it at first; it was all in the subconscious. But then something remarkable happened. Instead of feeling anxious and worried with what was going on at home, I felt secure and calm. We moved forward in the conversation, sharing anecdotes and stories and laughing over some of them. When I say empathic listening, I mean listening with intent to understand. I mean seeking first to understand, to really understand. It’s an entirely different paradigm. Empathic (from empathy) listening gets inside another person’s frame of reference. You look out through it, you see the world the way they see the world, you understand their paradigm, you understand how they feel. Empathic listening is so powerful because it gives you accurate data to work with. Instead of projecting your own autobiography and assuming thoughts, feelings, motives and interpretation, you’re dealing with the reality inside another person’s head and heart….You’re listening to understand. You’re focused on receiving the deep communication of another human soul. Therapeutic and healing? Like psychological air? Wow give me some of that already. In this day and age, we are all talking simultaneously, on different platforms, with viral messages flying everywhere and devices beeping every so often. It is hard to keep quiet, stay focused, and listen to any one person at a time. But for the sake of your family and marriage, this is a skill that we all urgently need to cultivate. Because of that unrushed conversation and heart-to-heart exchange, we were able to strategise and come up with a fairly detailed plan on how to help our child and our family. Because of those quiet moments, I saw how God had meant for us to come together to trust in Him and to work in partnership for His purposes. I also saw how my husband’s ability to look at things systematically complemented my own slightly more haphazard, but ideas-based thinking. I know we may not have the luxury to do this kind of retreats often…I know I sometimes complain of being ignored and not heard…but I also know this is something we will have to keep working at – listening in an unjudgmental, kind, truly understanding way. Feeling heard and understood is perhaps one of the most underestimated and overlooked ways of loving in this digital age. But giving each other that space and time to feel heard and understood and valued in a marriage is worth every single effort. It is truly a gift of love. So the next time your spouse or partner says “I’ve something important to share…can we talk?” Drop your phone, turn off the distractions, get you both comfortably seated, stay eye-to-eye so you can get the meaning of those words through the gestures and body movements, and seek to understand things from his/her perspective. The feeling of not being understood is one of the most painful in human experience. Not being appreciated and responded to depletes our vitality and makes us feel less alive. When we’re with someone who doesn’t listen, we shut down. When we’re with someone who’s interested and responsive – a good listener – we perk up and come alive. Being listened to is as vital to our enthusiasm for life as love and work. So is being a good listener. 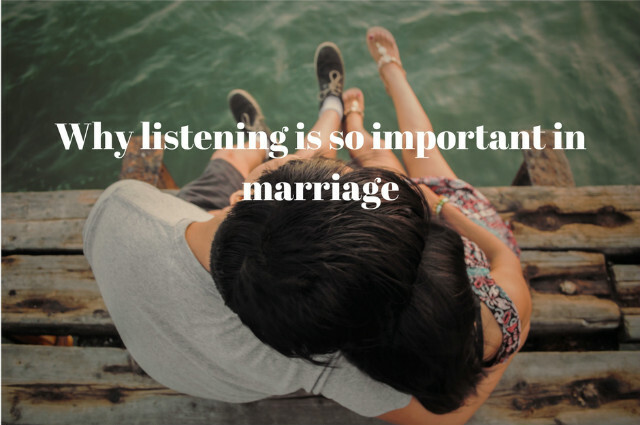 Understanding the dynamics of listening enables us to deepen and enrich our relationships. It involves learning how to suspend our own emotional agenda and then realizing the rewards of genuine empathy. I think more often than not, I end up being a bit like the goat – taking comfort in my own safety net, avoiding making myself vulnerable, and silver-lining other people’s dark clouds. 1) I should get out of my comfort zone and develop greater curiosity about people, especially those who are very different from me. Sometimes I allow fear to hold me back from striking up a proper conversation, and after a few steps forward I tend to retreat. 2) Seek to understand instead of judge. 3) Listen wholeheartedly, and avoid dishing out quick solutions and advice. As I work on honing my empathic skills, I also hope to build that in my children. Children who are empathic tend to do better in school and in social situations. 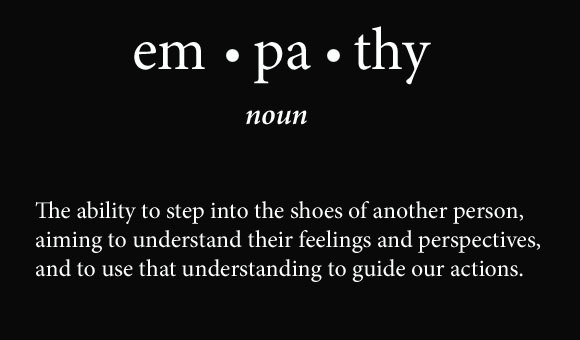 Empathy also reduces aggression and is seen as the solution to bullying and other anti-social behaviour, as evidenced by Roots of Empathy, an evidence-based classroom program that has shown significant results in reducing levels of aggression among school children while raising social/emotional competence and increasing empathy. Simply by allowing school children to observe the growth and development of an infant over an entire school year. It’s definitely a good skill when it comes to conflict resolution. Vera and JJ now fight multiple times a week. Over the skate scooter, over who gets the last chocolate or biscuit, over who pushes the lift buttons… Anything and everything is a potential minefield. With JJ, it’s a different story. She’s inconsistent towards him – at times deciphering his wants and needs and helping him address those; at times ignoring him altogether. I’ve praised and acknowledged her whenever she demonstrates some level of goodwill and kindness towards her brother. And vice versa with JJ. But on some days, both are unable to give in, JJ tries to grab something or unknowingly pushes Vera too roughly, and BOOM, tearfest. I’ve had to step in and play mediator at least three times the last week. (I usually try to let big sister negotiate with him on her own, but I do step in when things go downhill.) I would bend down, eye to eye with the perpetrator or the person who looks most hurt at the moment (read: bawling loudly), and ask for a brief description of what happened. Whodoneit usually doesn’t matter to me as I want them to recognise that both are at fault. Both have been selfish. Both have done wrong. “Sad” come the usual reply. Or “angry.” Sometimes…Silence. Empathise with your child – acknowledge their emotions; don’t belittle them. “I know you really want to tie your laces yourself.” Or “Are you feeling angry because it was your turn to press the lift button but little brother pressed it instead?” Let them know that it isn’t wrong to feel upset, rejected, lonely, or afraid. But teach them to express these big emotions verbally, and give them ideas to cheer themselves up such as hugging their lovey or playing with their favourite toy. Give them opportunities to hear each other out. Practise talking about your emotions in front of them too. Read books about feelings such as My Many Coloured Days by Dr Seuss and The Very Cranky Bear. Use pretend play – We’ve been discovering the world of pretend play lately, and I find it’s really useful for exploring even the most difficult, hard-to-speak-about emotions. Any soft toy can take on an identity and personality of its own so be creative and dramatic! Last but not least, kids learn the most by how they’ve been treated. By us, the parents. When they are upset, cranky, or frightened, do we shut them out or scold them for feeling those emotions? This is a reminder for myself too, and I hope we learn to treat their feelings with care, so that they too can grow to be caring, sensitive, and empathic individuals. Do you have a suggestion on how to encourage empathy in our children? I would love to hear your views and experience. 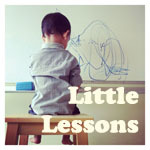 This is week 15 of the Little Lessons series, which runs on the blog every Thursday. Do grab our badge and link up your little lessons / learning activities below!